With Winter upon us, many people are dreaming of their next ski vacation to hit the slopes and enjoy some fresh powder. But if you only have one winter vacation, how do you pick the absolute best ski destination to make the most of your time? 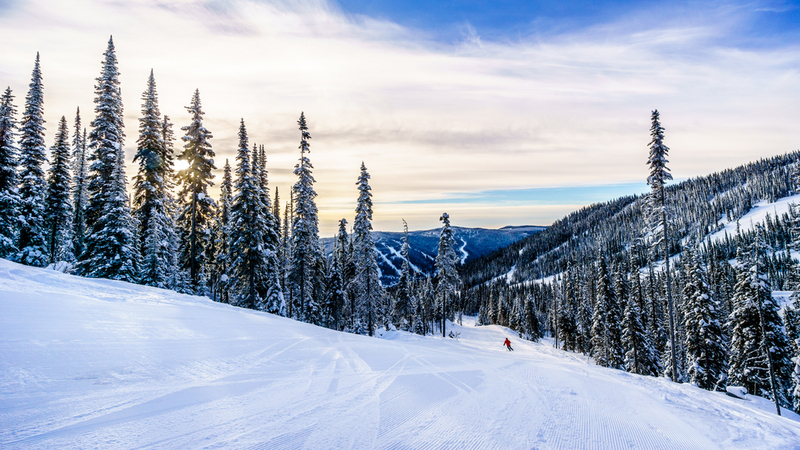 With our helpful list of the top ski resorts in North America, of course! These two resorts are within a stone’s throw of one another just south of Salt Lake City in the Wasatch Mountains of Utah and both offer fabulous skiing conditions for families and beginners. A rare skiing-only mountain (snowboards are banned,) Alta is one of the oldest skiing spots in the country. Half of its trails are beginner or intermediate so this no-nonsense resort is a great bet if you want to get your family hooked on the sport of skiing. If skiing down long, winding trails over famously dry powder overlooking the serenity of Banff National Park seems like bliss to you, you’re not alone. Lake Louise Mountain ranks as one of the top ski resorts in North America every year for its great mix of terrain, unparalleled views, and the bevy of other winter activities visitors can enjoy if they get tired of skiing. This gorgeous ski resort located adjacent to Glacier National Park offers some of the most stunning scenery in America for skiing. Despite the great views, it’s also very reasonably priced all winter long, making it a great choice for those who want great trails at a fraction of the cost of some of the bigger-name resorts. You can’t go wrong staying at the largest (and arguably the tallest) ski resort in all of North America. You have your pick of two side-by-side mountains and with a continuous vertical of 5,354 feet, even one run down these massive slopes seems to last forever. And when you’re ready to thaw out, enjoy perusing the quaint little city of Whistler. This resort sandwiched between two national parks is not for the faint of heart. Affectionately named “the big one,” Jackson Hole is best for experienced skiers looking for thrills on the most difficult terrain in the United States. The Jackson Hole skiing experience is rewarded handsomely with panoramic views of the towering mountain peaks and the beautiful surrounding lakes. Since Colorado is the best-known skiing state in the United States, it may be tough to sort through all of the various options, but Vail deserves its #1 spot as the best ski resort in the country. Vail is the definition of luxury, and the price tag proves it. Although expensive, Vail Mountain Resort is everything you could want in a ski resort. It has over 5,000 acres of varied terrain so whether you’re brand new to skiing or a seasoned pro, you’ll find a path that suits you with views that can’t be beat.